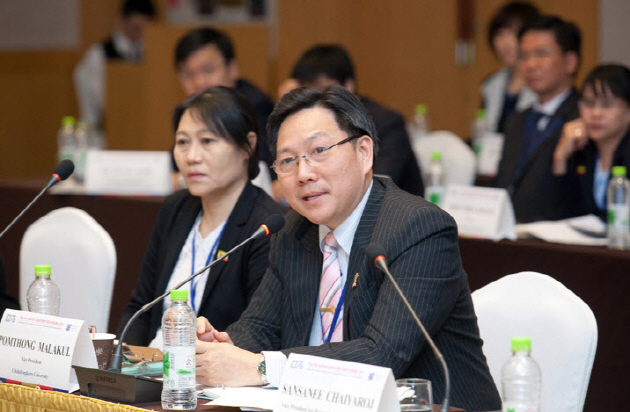 On May 12, representatives from universities throughout Asia met for the fifth annual Asian Universities Forum, hosted by Seoul National University. Out of the 25 universities that are members of the Forum, 23 universities from 15 countries participated in this year’s event. The Forum was held in the Mugunghwa Hall of the Hoam Convention Center in SNU and was composed of two sessions chaired respectively by SNU President SUNG Nak-in and Vice Chancellor of Kathmandu University, Ram Kantha Makaju SHRESTHA. Furthermore, President Sung shared the two initiatives launched by SNU to promote the qualities of virtue and compassion: the SNU President Fellowship and the SNU in World Program. The former provides education opportunities in SNU for faculty members in developing countries, while the latter gives SNU students a chance to study in universities around the world. The President stated that the SNU President Fellowship allows for a conjoined effort by Korea and the respective countries of the selected faculty members to strive for the common goal of socio-economic development. Meanwhile, the SNU in World Program exposes students to new experiences and learning environments to help them become global leaders. The Forum also included speeches from representatives from eight different universities and featured vibrant discussions on this year’s theme. After the sessions, the university representatives received a tour of the SNU Museum and Kwanjeong Library. 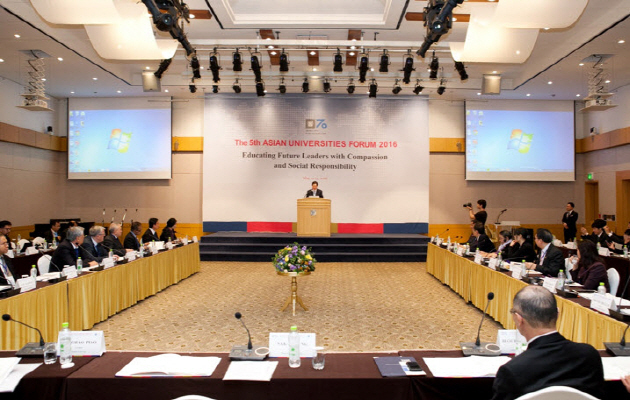 The Asian Universities Forum is an annual event that was first initiated by former SNU President OH Yeon-Cheon in 2011. The Forum aims to provide a setting for exchange of views on sustainable development in the global scientific and educational arena. Next year’s Asian Universities Forum is expected to be held at the National University of Mongolia. This year’s Asian Universities Forum was attended by SNU President Sung Nak-in, Kathmandu University Vice Chancellor Ram Kantha Makaju Shrestha, Yanbian University President Yonghao PIAO, University of the Philippines Diliman Chancellor Michael L. TAN, Thammasat University Vice Rector for Academic Affairs Pipop UDORN, Royal University of Phnom Penh Vice Rector Ratana SOM, University of Battambang Rector Sieng EMTOTIM, Bogor Agricultural University Rector Herry SUHARDUYANTO, Al-Farabi Kazakh National University First Vice-Rector Burkitbayev MUKHAMBETKALI, Mahidol University Vice President for Research and Int'l Relations Sansanee CHAIYARO, Keiin Institute of Business and Sciences Director of Development Askarbek MAMBETALIEV, National University of Uzbekistan Professor Mukhamedov GAFURDJAN, Foreign Trade University President BUI Anh Tuan, Nanjing University Vice President ZOU Yajun, Ateneo de Manila University Vice President Jose M. CRUZ, SJ, National University of Laos Vice President Somsy GNOPHANXAY, Monywa Institute of Economics Professor Thin Thin MYINT, Chulalongkorn Unversity Professor Pomthong MALAKUL and others.